Found one file extension association related to 3DCrafter and 1 file format developed specifically for use with 3DCrafter. 3DCrafter is a real-time 3D modeling and animation tool that incorporates an intuitive drag-and-drop approach to 3D modeling. Complex models can be constructed from simple 3D primitives, or created using 3DCrafter's Shape Building Tools. 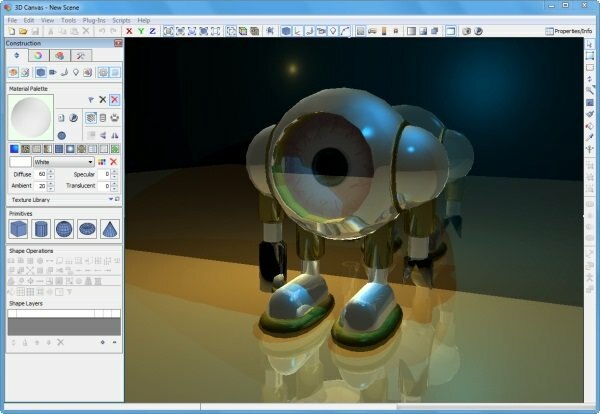 Modeling tools are provided to deform, sculpt, and paint 3D shapes. Creating an animated scene is as simple as positioning the shapes within your scene for each point in time in your animation. 3DCrafter will ensure that the resulting animation runs smoothly. Your animation can be stepped through a frame at a time, viewed in real-time, or recorded to a Video (AVI) file so that you can distribute your creation. Tool roll-up groups allow you to customize the 3DCrafter interface so that only those items you use most frequently are visible. And if you need access to a less frequently used feature, the tool roll-up is always one click away. The standard version of 3DCrafter is a fully functional product provided as freeware. Upgrades are available for those who require additional features either for game development or for rendering photo-realistic images. If you need more information please contact the developers of 3DCrafter (Amabilis Software), or check out their product website.